After a pair of games in eastern Canada, the Florida Panthers (25-12-4) take to the other end of the Great White North with a 9:30 game against the suddenly better Edmonton Oilers (17-22-3). Florida will be trying to extend their NHL season-long 11-game winning streak against the Oilers, who are 8-2-0 in their last 10 against the Cats. After watching the Oilers lose Saturday night’s game against Tampa Bay in a game they completely dominated – Tampa had all the puck luck in the world, scoring three goals in the third on shots that all bounced off Oilers — I’ve come up with a couple of areas Florida should focus on in an effort to get to a dozen consecutive wins. Don’t run-and-gun: Edmonton is young and talented, icing highly skilled forwards, some who were No. 1 overall or lottery selections. That youth likes to get out and go to demonstrate their abilities. Florida doesn’t need to get caught up in matching the fast pace of the game and should just take the opportunities presented. Hey, I’ll take Jonathan Huberdeau or Sasha Barkov against Cam Talbot or Anders Nilsson in a breakaway all day over Taylor Hall against Roberto Luongo or Al Montoya, but the Panthers don’t need to play at Edmonton’s pace. Stay within the system: Coach Gerard Gallant has utilized a tight defensive system that clogs up the neutral zone, creates traffic in the shooting lanes on attempted shots and allows breakouts to get possible odd-man rushes. If Florida can demonstrate their system works better than first-year Edmonton coach Todd McLellan’s, the young Oilers and Barkov-like Leon Draisaitl (by far my favorite non-Cat player from the 2014 draft) may become frustrated and slip into some bad habits. This could lead to breakdowns and offensive chances. Don’t get caught up in the streak: The team and Gallant have handled the winning streak and its attention like true pros instead of newcomers being fawned over as media darlings – actually, like they’ve acted like they’ve been here before. That said, there’s no reason to press and gamble against Edmonton. A look at the standings says Florida is five points ahead of second-place Detroit in the Atlantic, and for once Florida isn’t chasing the divisional leader. Going to overtime in Rexall Place against a Western Conference club and being assured of at least one point in the standings isn’t the worst thing in the long run. EMPTY-NETTER: Florida immediately treks to Vancouver for a game Monday night against the Canucks. I watched all of the Vancouver’s game Saturday against Tampa – an overtime loss to the Canucks – and this version of Luongo’s old club isn’t that special. The Sedin twins didn’t stand out in the loss to the Bolts, and none of the veterans, including winger Radim Vrbata (who may be a rental target for a playoff team, maybe in South Florida), stood out at all. What Vancouver does have is a nice young core. Jake Virtanen has exceptional speed and flair to his game, and Bo Horvat is fun to watch, too. Also, former Panther goalie Jacob Markstrom, once thought to be the netminder of Florida’s future, played a strong game against Tampa (aside from his flopping effort on Nikita Kucherov’s game-winner), though it would be hard to picture him as Vancouver’s future No. 1. Staggeringly, Vancouver has scored two goals or less in 26 of their 42 games, not exactly the high-flying numbers put up by the team over the last decade or so. Florida’s defense could be the difference. It will be a hard test in British Columbia, but don’t be confused into thinking this is the Vancouver that Luongo suited up for. Dale’s Deal Done, what’s up next for #FlaPanthers? With the ink just drying on the contracts of GM Dale Tallon, new assistant GM Tom Rowe and coach Gerard Gallant, the suddenly second-place Florida Panthers (21-12-4) can turn their attentions to the play on the ice and try to finish this season’s second half as strongly as the first. The suggestion and subsequent answer might put to rest the biggest fear of Florida fans, who’ve watched numerous odd-man rushes by the Panthers and man-advantages produce nothing more than an extra pass or whiff on a shot or…an extra pass. Really, overpassing and poor shooting have doomed the Panthers’ offense for the longest time (Billy Joel at BB&T Center reference). A December to Remember has transformed the Panthers, who were in sixth place in the Atlantic at 9-9-4 in late November and 16 points behind Montreal, into what clearly looks like a playoff team. Even without last year’s top goal scorer Nick Bjugstad, the Panthers have reeled off a 13-3-0 sizzling streak that has had them perched atop the division on two occasions. There are two approaches to take here. First, Tallon could leave the club as is – you know, the old “If it’s not broke, don’t fix it” method. One key would be getting Bjugstad healthy and back in the lineup, and that looks imminent. You might see him against his home state Minnesota Wild on Sunday. And while fans may not want this – and their complaints are loud ones – the club wants to work Dave Bolland back into the mix in a fourth-line role with Derek MacKenzie and either Quinton Howden, Connor Brickley or Shawn Thornton. The Panthers are paying Bolland all that cash for production, and they really want it in the playoffs. The other option – and the one I’m all for – is adding on like on Amazon. If Tallon and the organization feel they have something special – and last month would indicate that may be the case – then why just settle for getting in the playoffs? Dale didn’t do it last time the Panthers were playoff bound. He added John Madden, Jerred Smithson and Wojtek Wolski, who all made contributions down the stretch and in the postseason. The numbers say add. Florida is 16th in scoring at 2.60 goals per game, tied with Nashville and Calgary. On the back end, the defense has been stellar: The Cats are allowing just 2.24 per game – third in the league and a reflection of the strong play of Roberto Luongo and everyone in front of him buying in to Gallant’s system. And if the organization feels it has something special, then add. Maybe bring in a scoring winger and instead of just getting into the playoffs they secure a better spot and get home-ice. Then maybe play not just one round like against New Jersey, maybe a couple. Those playoff Cats that won the Southeast Division four years ago lost a league-high 18 games after regulation, cashing in on the loser point like it was a winning scratch-off ticket. 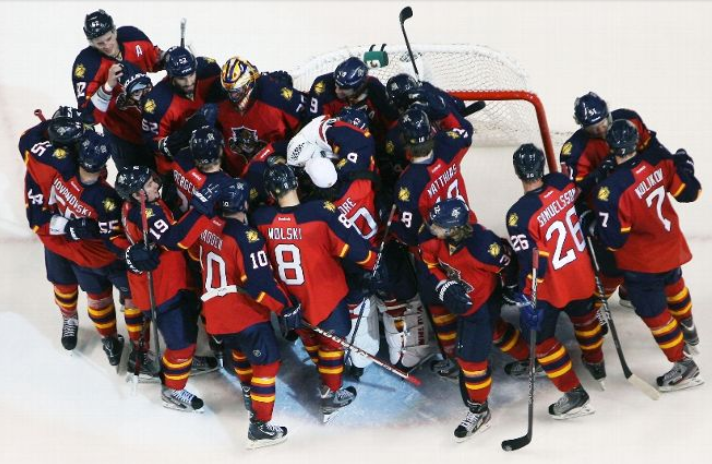 The Panthers these days are 6-4 in overtime and 5-1 in shootouts. They don’t just get to the extra session, they win more often than not. For starters, Tallon should look at Winnipeg, Columbus, Vancouver (Radim Vrbata played for Dale), Edmonton (glut of forwards now with Leon Draisaitl breaking out) and Anaheim to see if something can’t be worked out to bring in a 2nd line winger who can bury shots and boost scoring. Florida has the cap space and assets to do it. Tallon and company just have to figure out how special this team is.